Physical Therapy is a privilege to most and can be unaccessable. Health care is not approving prescriptions more and more. I’m creating a system that improves the access to resources and exercises for occupational therapy paitents. This will focus mostly on hands, elbows, sholders. This website will be a guide an resource for occupational therapy patients. It will mostly be a guide to correcting posture and behavioral patterns while using technology. This will be connected with an Augmented reality system I’m making for my senior project called OTAR. Physical Therapy is a privilege to most and can be inaccessible. Health care is not approving prescriptions more and more. 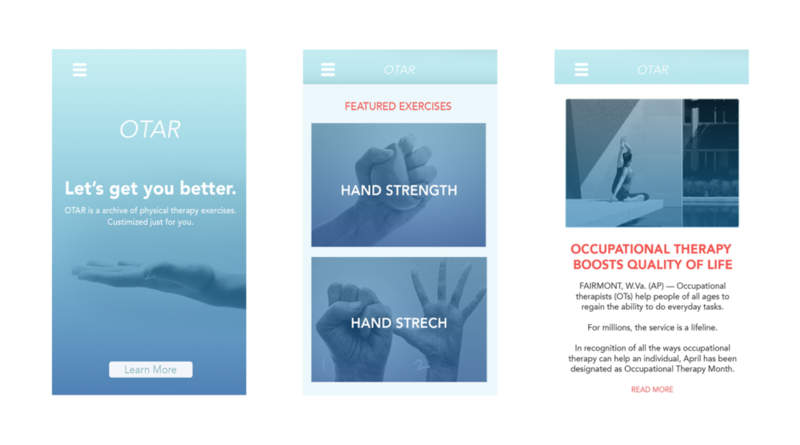 I’m creating a system that improves the access to resources and exercises for occupational therapy patients. This will focus mostly on hands, elbows, shoulders. This website will be a guide an resource for occupational therapy patients. It will mostly be a guide to correcting posture and behavioral patterns while using technology. This will be connected with an Augmented reality system I’m making for my senior project called OTAR. Kat is a student at Pratt Institute in Brooklyn, NY, majoring in Communications Design with a focus in Graphic Design. She is interested in Motion Design, Augmented Reality, Social Media Design, Print/Publication, Consumer Technology, and Branding. Her creative approach—no matter the medium—is to find points of integration behind the idea, technology, and fine art. She thrives to develop new systems or alter perceptions.